As dramatic a story as it is, the massacre at on December 29, 1890 at Wounded Knee Creek is hardly even talked about today. It is dismissed as a fairly minor event, significant primarily to those who want the government to address America’s racist history. Known mainly from Dee Brown’s 1970 Bury My Heart at Wounded Knee, which emphasized the injustice of destroying Indian resistance to white incursions, readers might think that everything that needed to be said about Wounded Knee has been said. 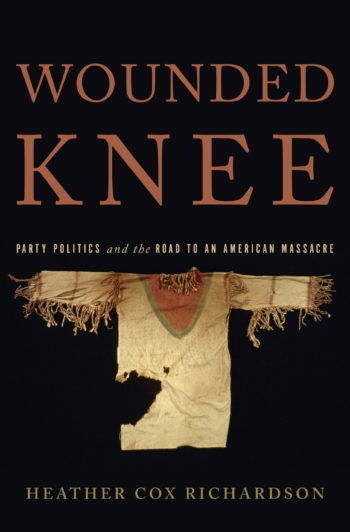 But rather than a footnote, the events at Wounded Knee are an epic story of American politics at work. The massacre of the Sioux in 1890 in South Dakota dramatically illustrates how political rhetoric, designed in this case to drum up voters for an upcoming election, can devastate the lives of individuals far away from the seat of power. Heather Richardson is, most recently, the author of West from Appomattox published in 2007 by Yale University Press. She is professor of history at the University of Massachusetts, Amherst. Superb … [Richardson’s] account of the confrontation that precipitated the massacre is riveting…While her description of that hell packs a wallop, Richardson’s greatest contribution is her meticulously researched, groundbreaking analysis of the tragedy’s root causes. Historian Richardson brings a fresh perspective to the massacre at Wounded Knee in her engaging study…. [She] describes the collision of incompetence, political posturing, and military might with elegant prose and the right blend of outrage and humanity, subtly highlighting the parallels between the disastrous partisanship of the late 19th century and the politics of today.